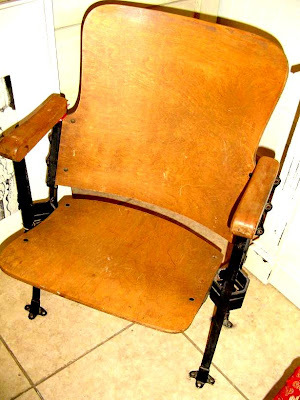 MIGNONNE: Cool Vintage Theatre Chair! Check out this way cool theatre chair, which could serve as an art installation or functional conversation piece in your home. Cast iron and wood, the seat adjusts up and down. This chair could be affixed to the floor, would make an interesting subject for painting a hot color ... or even painting a quirky scene on the seat or back. Of course, Johnelle can assist with bringing your vision to life! This spring, individuality, color and fun are the hot trends and this cool chair could serve as your palette for all three!